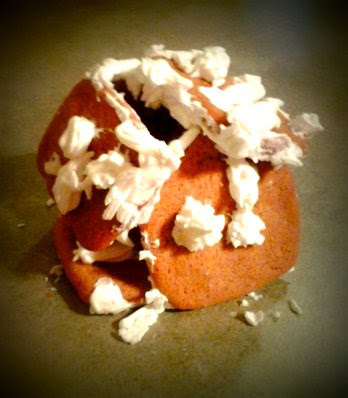 so movita beaucoup is having this gingerbread house contest called ginger 2012, and i thought i'd play along. i've never made a gingerbread house from scratch before. but how hard could it be? i have this cute 3D cookie cutter from good cook, that cuts all the shapes for a mini house, and i imagined a whole village of frosty topped buildings. so i found a recipe. one that didn't call for molasses, because i don't have any. and then i realized i didn't have any ground ginger either. i should have just hung up my apron there. but the cookies actually came out quite tasty! 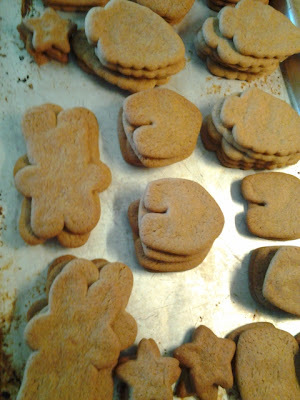 (i used pumpkin pie spice) they are nice and crisp, with just the right amount of spice. they are probably more kid friendly than traditional ones, since the flavor's not as strong. i should have chilled the dough in between, because my cookies spread a little too much. we made stars, bunnies, snowmen, trees, and lots of house pieces. 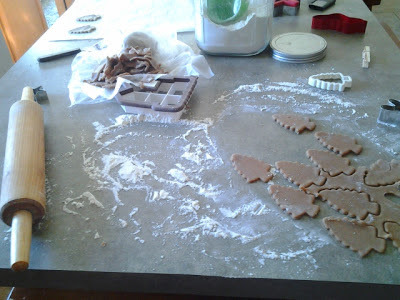 next, i dusted off the parchment triangles i bought back in 2001 for that wilton class i took. made some piping cones, whipped up some royal icing, felt very professional, and we got to work. the kids got to decorate their bunnies and snowmen with m&ms and nerds from the halloween bucket. 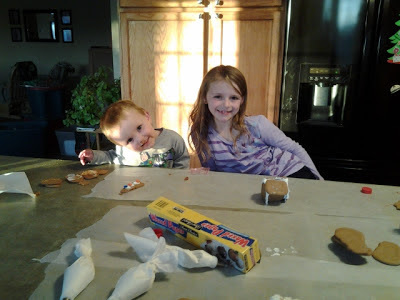 sawyer spent his time licking the frosting off his cookies and eating the candy. the three older kids tried to build houses. no luck. 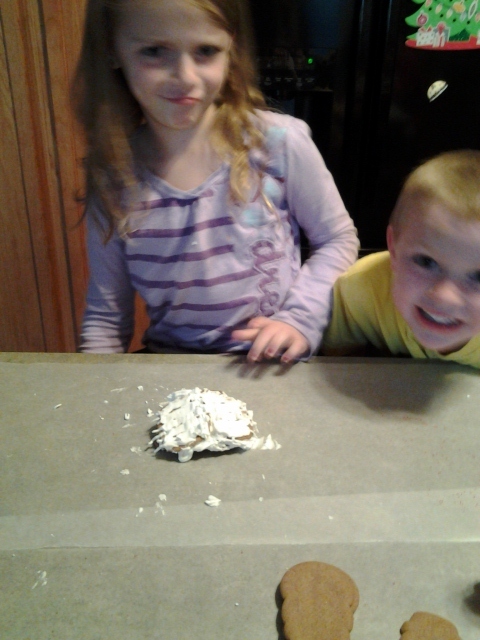 they all collapsed before long under the weight of too much icing. i tried to tell them. nobody ever listens to me. 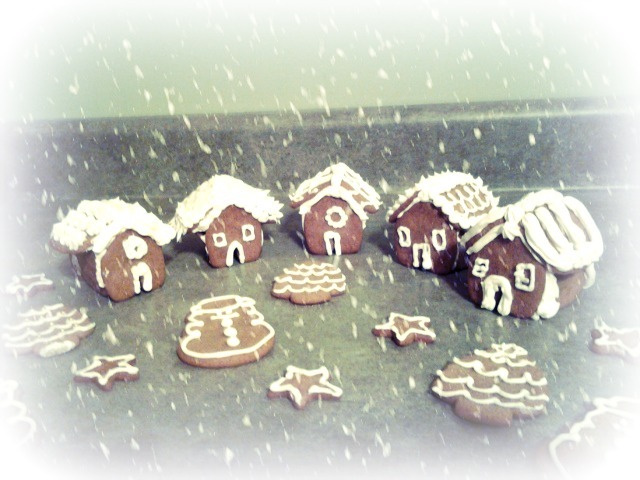 and i tried my best to make a pretty snow capped village. it's a funny thing, my piping skills haven't improved over the last few years with no practice! (it's been awhile since i decorated anything.) i added some snowy effects using picmonkey :) and, my buildings are still standing. in your face, children! brings back such good memories! Dude, you've gotta enter that freakin' village. Oh, and then your kids should enter the... pile they created. CUTE KIDS WITH CRUDDY HOUSES GET VOTES.